To say this was an 'enjoyable' trip would be an understatement. This trip has been an eye opening and harrowing experience, one that will stay with us for a long time. Learning about the culture of Poland, and the history of the Holocaust was very thought provoking and for many was a once in a lifetime experience. When we arrived at Krakow we went on a walking tour of the city. We saw many historical monuments, one of which being Wawel, the dominating natural feature of the town, Kazimierz, the former Jewish quarter and the university district where we saw many university buildings, where many well-known people studied, including the famous astronomer Kopernicus, the first to challenge the theory that the Earth was the centre of the universe. On Tuesday we visited the Schindler Factory Museum, where we were given a guided tour and learned more about Oscar Schindler, a man declared righteous of the nation by Yad Vashem, a Jewish group, because of his bravery saving many Jewish lives during the war. Following this we went to the Wielikczka Salt Mines, a UN World heritage site, where we walked around the multitude of passageways which are around 110 metres below the surface. Before the evening meal at the hotel, we had the opportunity to go shopping at the Sukiennice, an original medieval cloth hall, more than 800 years old. Inside was a vast array of amber jewellery, in many colours, the perfect present for Mother's Day, so sir told us! On Wednesday we visited Auschwitz, the main camp and Auschwitz II called Birkenau, where we found out about the treatment of the people within the camp, which was horrific. They slept 4 people to a bed, had straw as their mattresses and there were a vast number of deaths which took place especially in the infamous gas chambers. This experience was one I will never forget, but one I am truly pleased to have had. We then went to the Galicia Museum after our tour. Here we viewed the ‘Traces of Memories' exhibition, where we learnt more about the Jewish culture and how out of the original 3.5 million Jews, only 8 thousand remain. The exhibition emphasised this point and the importance of people like us sharing what we learnt and helping to preserve the Jewish culture that remains today. After viewing the exhibition, we spoke to Monika Goldswasser, a holocaust survivor. She told us her story and how it felt growing up at such an awful time when her culture was destroyed. She explained how her family put her up for adoption as a very young child in the hope that she would get a good life. She explained how she didn't see a picture of her birth mother until she was 50. Despite her not being able to speak English, the tone of her voice showed how the past had affected and shaped her as a person. It was a truly interesting thing to witness and I am glad to have met such a lovely person. The evening meals were all lovely three course meals and I think I speak for us all when I say we learnt a lot more ways to cook chicken and potatoes! I would like to thank Mr Scott, Miss Sampson, Mrs Wade and Miss O’Brien. 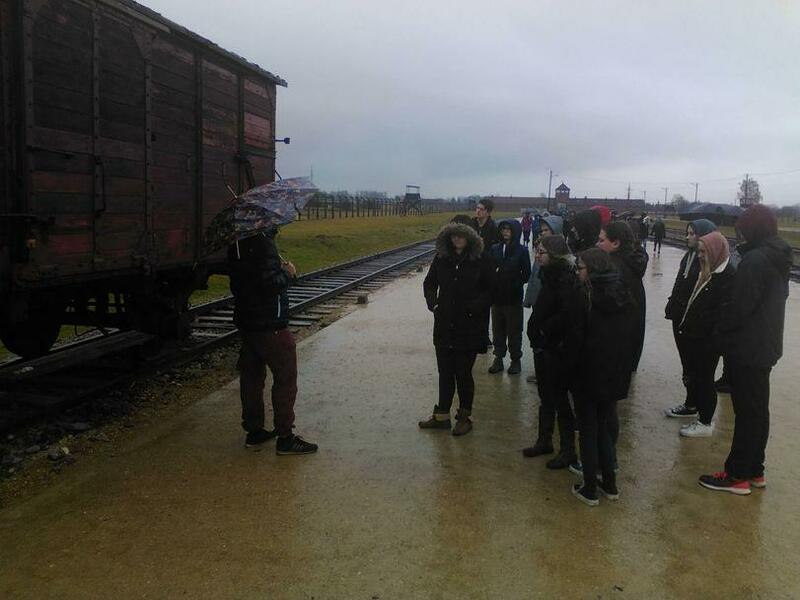 Pictured: students at the Birkenau Death Camp where they were unloaded for selection to either work or go to the gas chambers.